Are you thinking of buying more printers for several computers in your home or office?If you,you don't need to do that.You don't need multiple printers just because you have more than one PC.I am giving you a easy guide to sharing your printer from one computer to another when they are connected via a wireless network or a local area network. you can do this in four steps. 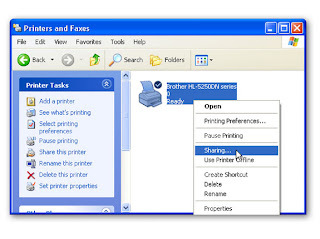 Get started by opening the Printers and Faxes control panel in Windows XP .In Vista simply called Printers.Right-click on the printer that you want to share, and then choose Sharing. In the printer's Properties menu, the Sharing tab should now appear. Click the radio button next to "Share this printer" and give the printer a share name that you will easily recognize. Click OK when you're done. Afterward, the icon in the Printers and Faxes control panel should display a cupped hand on the printer's icon. On each of the computers that you would like to use with the shared printer, you will need to add the shared printer. Make sure each of these machines is connected to your network before opening the Control Panel and selecting the Printers and Faxes (in XP) or Printers (in Vista) control panel. Once it's open, click "Add a printer" to proceed. On the next screen, choose "Add a network, wireless or Bluetooth printer." Windows will automatically search your network for any shared printers and display its finds in the "Select a printer" window. You should see your newly shared device listed. Select it and then click Next. For the vast majority of printers, Windows will automatically download the appropriate driver for you at this point, if it's not already on your system. Your shared printer will now appear in your Printers and Faxes (or Printers) control panel, and should also appear as an option from within the Print menus of all your applications. From here on out, the hardest part of printing over your network should be walking over to the printer to grab your documents. That's all waht you have to do for sharing a printer when you are connceted in a network. 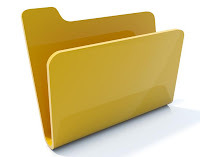 For many reasons there produced empty folder in the local drive of you PC.specially when you are installing and un-installing many application to the PC you don,t know how many empty folder makes your PC so slow.it may be sometimes a boring or difficult work to find those empty folder and to delete.is there any solution? yes,you can do this work easily by using Empty Folder Nuker.it's a freeware and you don't need to install it.just download Empty Folder Nuker of 340KB & run the programme and find the empty folder and delete.